Well, that was certainly something! Putting aside the palpable fan delight still showering television sets across the globe (as well as a few questions I might have about Rick and Michonne going forward), it’s always nice to see writers leaning into unanticipated chemistry and fan support. Michonne certainly wasn’t written as a love interest for Rick in any form, the same way Arrow star Emily Bett Rickards initially only appeared in a small Episode 3 role, but there’s no ignoring the manner in which certain actors make relationships leap off the page. That feels like a lesson The Walking Dead has steadily absorbed over time, that while diversions like Terminus or Beth’s hospital certainly shake up the show’s comic inspiration, embracing some of the more heightened comic sensibilities liven things up far more effectively. I was surprised reaction to last week’s “No Way Out” proved so divisive as it did, but there’s no denying its particular visual flair and an overall sense of catharsis, carried into this week by the introduction of a fan-favorite like Jesus. As with a number of adaptations before, Tom Payne doesn’t quite match the authoritative characterization on the page (and just like Rosita, the ensemble is a bit questionable in live-action), but introducing Jesus with a sort of Tom and Jerry relationship to Rick and Daryl* brings a lot more fun than The Walking Dead is used to having, and it shows. Talent for misdirection is one thing; introducing an acrobatic character with martial arts skill brings another layer of diversity to static zombie kills, and particular manner in which he got under Daryl’s skin really livened up an otherwise rote supply mission. Admittedly, the gatekeeper wasn't deterring many threats on his own. Personality has long been one of The Walking Dead’s biggest deficits, something “The Next World” jolts inward not only by a small time jump (having one-eyed Carl in a photo got that across quickly), but the use of real music like Boston’s “More than a Feeling,” or Rick’s penchant for older tunes annoying the hell out of Daryl. Season 2 spent an exhaustive amount of time on Carl’s recovery, and jolting past that feels like the better move, especially when Rick and the rest of Alexandria have seemingly recovered along with him. Hell, the town is practically upbeat now, and it’s refreshing as all get-out. Of course, Carl is understandably a bit less friendly than when we left him, though I’m not sure how effectively “The Next World” managed to communicate that through his outdoor reading sessions with Enid, who herself remains more cipher than actual character. Dovetailing the recovery of Zombie Deanna with Michonne and Carl’s relationship also fell a bit flat, albeit less so than the focus on Spencer himself. Background characters like Spencer could certainly use the development, and it makes sense to offer Deanna a proper goodbye, though I wonder if the bond formed between Spencer and Michonne served mainly to surprise us by Rick and Michonne’s pairing* at the end. *Looking at it from a comic angle, Rick and Michonne more or less occupy the same space as Rick and Andrea, who herself has been largely grafted on to AMC’s Sasha. Michonne actually had a brief relationship with Morgan in the books, and again, it makes much more sense to capitalize on existing chemistry than follow canon. Still, one wonders where Rick and Michonne might reasonably go from here, given the series isn’t likely to kill off either, or become a love story. Like, five minutes it's been, guys. I was in the camp that enjoyed the premiere, and It was understandably impossible to keep that immediate momentum through a half season typically comprised of two great ones, too good ones, and four hours of filler, but this was a still a welcome and hearty helping of fun, with legs to move forward as well. Paring Rick and Michonne together is definitely something of a wildcard, but Jesus in particular makes for a fascinating new addition. Assuming the comic reasons for “really” needing to talk (maybe hang out until morning, perv?) 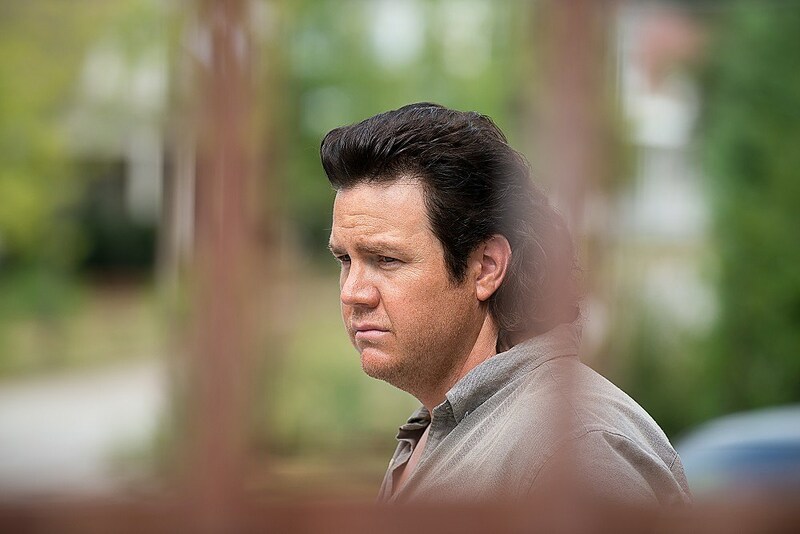 hold up, he’s definitely a gate way for some new kinds of Walking Dead storytelling, and that’s something we sorely need on the road to our next big bad. Maggie’s around, if Enid ever wants to talk. Great scene, everybody! I doubt if the backstory behind the note Enid finds is all that interesting, but how much do you want to bet we’re going to get it? Interesting food motif through the hour, as Enid shares food with Carl, just as Daryl and Rick do, and later Rick and Michonne. Lifesavers count! 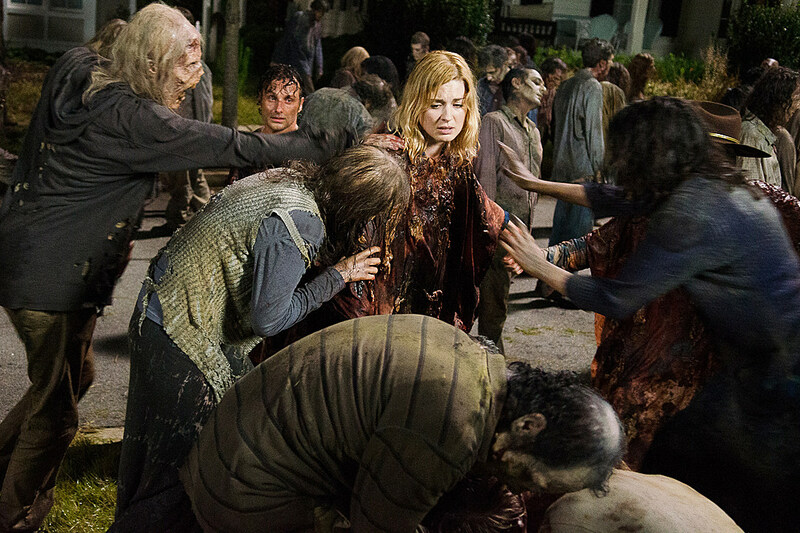 However long it’s been since the siege, Deanna looks pretty good for a walker, no? Tovah Feldshuh’s pushups must have really paid off. I listened twice, and can’t for the life of me figure out what Daryl was yelling at Jesus about a “conclusion” during the field chase. And why even pursue him, if he was off the truck, and no longer a threat? Almost half of Deanna’s scenes were spent in the Alexandria cemetery, and they don’t even make the effort to bury her there. You know, with her husband? Maybe even what was left of Aiden? The Walking Dead will return on February 28, airing at 9:00 P.M. on AMC.